CEDAR CITY — The Utah Shakespeare Festival and the Southern Utah Museum of Art (SUMA) recently broke ground on a multipart project meant to enhance the guest experience at the Beverley Taylor Sorenson Center for the Arts on the campus of Southern Utah University. 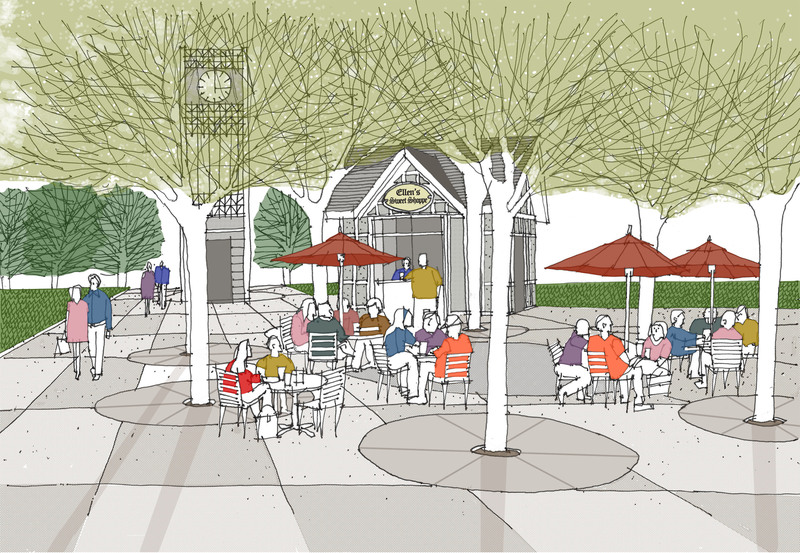 The project includes a new gift store, a concessions stand, a clock tower, an outdoor gathering area and landscaping and seating upgrades at SUMA, according to a recent news release announcing the projects. “Generous donations from the Gardner and Adelman families have made these improvements possible, and I’m grateful for their support,” Mack said. In addition to private donors, Iron County has awarded the overall undertaking a grant via the county’s restaurant tax. Southern Utah University also contributed significantly to enable the construction of the new gift shop. The largest four projects are meant to enhance the Festival experience by providing shopping, concessions and gathering space to the area east of the Engelstad Shakespeare Theatre. The new Festival Gift Shop will be built into the east lobby of the Engelstad Theatre. The 1,200-square foot shop will be filled with souvenirs, clothing, books, programs and more and will be operated by the Southern Utah University Bookstore. It will be open from 10 a.m. to 8 p.m. the days of plays. The current Randall Gift Shop will still be open, but its footprint will be slightly smaller. The outdoor gathering space, or “outdoor living room,” is just to the east of the new gift shop and will provide an inviting and comfortable space for guests to meet and mingle, relax, have a snack or lunch, and enjoy their time at the Festival. For guests attending morning discussions in the seminar grove, Ellen’s Sweet Shoppe will be serving coffee and light breakfast items. Much of the concrete will be removed and replaced by lawn areas, Victorian gardens, a colonnade of shade trees and seating and tables. Between the Engelstad Theatre and the ticket office will be the new Ellen’s Sweet Shop and the Gardner Family Clock Tower. The sweet shop will be open from 8:30 a.m. until intermission of the evening play and will sell candy, ice cream, prepared food, snacks and drinks. 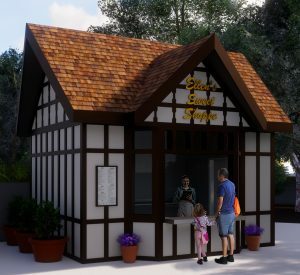 For guests attending morning discussions in the seminar grove, Ellen’s Sweet Shoppe will be serving coffee and light breakfast items. It is named for Ellen Adelman, whose family and friends provided the funding. The new clock tower is named for Ella Gardner, who generously provided the funding for it. In addition, two projects will be completed around SUMA. 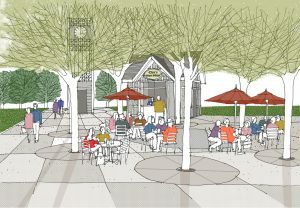 Pathways, landscaping and seating will be added to the Stillman Sculpture Court on the east side of SUMA adjacent to the Ashton Family Greenshow Commons. This will enhance the ambiance and comfort of guests as they wander through this outdoor collection of sculpture. Seating will also be added to the Stewart Family Foundation Plaza, which serves as SUMA’s front door. Construction is scheduled to be finished by the first week of June, before the first Festival production begins June 27. Concurrent with the festival’s opening is a related exhibit in SUMA titled, “Karl Momen, Homage to William Shakespeare,” which will run through Oct. 5. The 2019 lineup of plays at the this year’s festival includes four by William Shakespeare, namely “Macbeth,” “Hamlet,” “Twelfth Night,” and the festival’s 4.5-hour finale of the King Henry VI plays, dubbed “The Conclusion of Henry VI: Parts Two and Three.” In addition, the season will include “The Book of Will” by Lauren Gunderson; “Joseph and the Amazing Technicolor Dreamcoat,” by Tim Rice and Andrew Lloyd Webber; “The Price,” by Arthur Miller; and “Every Brilliant Thing,” by Duncan MacMillan with Jonny Donahoe. Tickets for the 2019 season are now on sale: Visit the festival website at bard.org, call 800-PLAYTIX or visit the ticket office next to the Anes Studio Theatre.